Home > Products > ChargeIt by Jay Silver Beaded Acrylic Round Charger Plate 13"
Add a glamorous touch to your upscale table setting with the ChargeIt by Jay Round Silver Beaded Charger Plate. 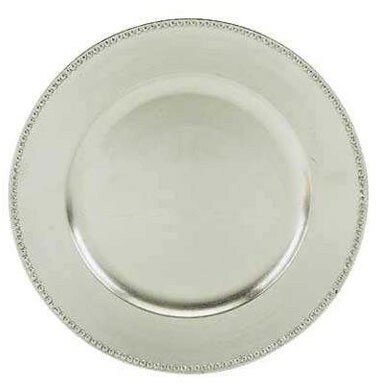 Beautifully accented with an intricate beaded pattern along its rim, this attractive silver charger has a luxurious look that complements any high-end decor and dinnerware collection. Combining style and longevity, this charger plate is made from premium quality acrylic boasting a delicate look that belies its strength and exceptional durability.